Click Here to Buy Boost™ Pudding in Bulk. Boost™ Pudding was formulated by Nestle for people who have difficulty swallowing or who are unable to chew. It has become widely used during cancer chemotherapy to counter loss of appetite, to help individuals recovering from anorexia, to bolster the growth of children with a ‘failure to thrive’, and to address other weight management and nutrition issues. Rich and creamy, this delicious treat is just like the puddings many remember fondly as a favorite after-dinner treat except that it is packed with nutritional value. A single 5 ounce can of Boost™ Pudding provides 25% of the recommended daily value of calcium in just one serving, 7 grams of high-quality protein, and a healthy dose of over 20 vitamins and minerals. 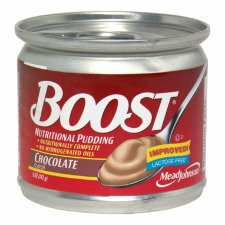 Each 5 ounce cup of Boost™ Pudding is packed to the brim with nutritional value. 100% RDI: 15% of most essential vitamins/minerals. Protein: 7 Grams (14% DV) to help your body recover from illness, injury, or infection. Provides 25% of the Daily Value for calcium, yet is lactose–free. Carbohydrate: 33 grams (11% DV). Low in sodium (only 125 milligrams per serving). Low in cholesterol (less than 5mg per serving). 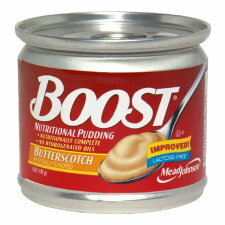 Boost™ Pudding is a Medical Food. Consult a healthcare professional before changing your diet. Boost™ Pudding is lactose-free, gluten-free, low-residue, and kosher making it a safe choice for special diets. It is also low in cholesterol and sodium. Available in 3 Great Flavors! Water, Sugar, Maltodextrin, Milk Protein Concentrate, Canola Oil, Food Starch Modified (Corn), High Oleic Sunflower Oil, and less than 1% of Corn Oil, Calcium Caseinate, Sodium Caseinate, Natural and Artificial Flavor, Salt, Sodium Stearoyl Lactylate, Yellow 5, Yellow 6, Carrageenan. Vitamins:Vitamin A Palmitate, Vitamin D3, Vitamin E Acetate, Vitamin K1, Sodium Ascorbate, Ascorbic Acid, Beta Carotene, Biotin, Niacinamide, Calcium Pantothenate, Vitamin B12, Vitamin B6 Hydrochloride, Riboflavin, Thiamine Hydrochloride, Folic Acid, Choline Chloride. 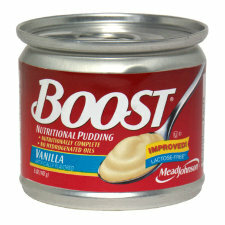 Click Here for a Great Place to Buy Boost™ Pudding in Bulk. BoostPudding.com is not endorsed, sponsored, or specifically approved by Société des Produits Nestlé S.A.